- LiveBoost enhances system responsiveness through real time adjustment of CPU, Drive and RAM. - Stability Guard prevents stability threats to keep Microsoft Windows fast and without problems. - Program Accelerator realigns disjointed program documents. - Memory Mechanic restores lost RAM in real time. - Startup Optimizer automatically boosts PC startup 22 ways. - Guided Recommendations connects to the System Mechanic community to achieve more. - NetBooster accelerates videos, internet, downloads and games. 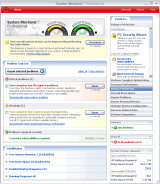 - Total Registry Revitalizer repairs registry problems and stabilizes Microsoft Windows. - PC Cleanup cleans more than 50 types of junk files. - EnergyBooster puts your computer in overdrive for maximum performance. - CRUDD Remover detects and deletes unused extra programs. - Privacy Cleaner periodically wipes internet and chat history, cache and clutter. Good explanation of PC problems. System Mechanic Professional has been tested by Download82.com team against viruses, spyware, adware, trojan, backdoors and was found to be 100% clean. Our editors will recheck this software periodically to assure that it remains clean.